Chocolate covered toffee bars have been around for a long time. In this review we are pitting two of the most popular against each other – Daim and Skor. 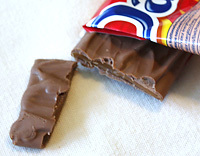 Daim is made by Swedish chocolate company Marabou, and was introduced back in the 50s. The Skor bar is made by Hershey’s and has been around since the early 80s. Incidentally, “Skor” is the Swedish word for shoes, so if you ever in travel in Sweden don’t ask for a Skor bar by name. Having grown up in Sweden I’ve eaten daim since I was a small child, especially as it one of my dad’s favorite candy. So to make up for my possible bias, Michael will be doing the testing with me. I kind of like the skor wrapper better, and I like that it looks a bit retro. The Daim looks more modern and might be more appetizing to someone who has not tried either before. Daim is the clear winner. Sure, it’s a bit over the top with the exploding candy and bright colors, but that’s what you’d want for a candy bar. Also, the slightly uneven curve on the extended k really bugs me! I don’t taste much difference, and probably couldn’t tell them apart in a blind test. The chocolate on the Daim bar taste a bit less. 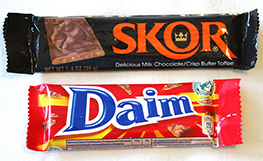 The Daim bar is a bit softer and the Skor bar is crunchier, but overall they are very similar. The chocolate is the biggest difference. The Daim bar has soft milk chocolate while the chocolate on the skor bar is grainier and waxier with an inferior cheaper taste. Not so surprising since the Skor bar is made by Hershey’s. The toffee part is a bit thinner and softer on the Daim bar with a sweeter and more buttery taste. Considering that they taste almost the same to me, I would choose the cheaper one, which is the Skor bar. Like I said, I might have a little bias, but to me the Daim bar is far superior. The Skor bar is not bad, but it just can’t match the taste of the Daim bar. 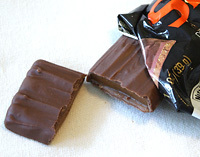 Skor bars are easy to find in most stores. Daim can be harder to locate. They used to be sold in IKEA stores, but it appears they no longer are. I bought my bar at World Market which has locations throughout the southern and eastern US. Good news for Daim fans, Ikea does sell these (again?). We just picked up a heavenly bag of minis (Sept 2014) in the Baltimore area. Munching as I type.